Metals reduction into submicro/nano size through bhasma preparations for therapeutic use is well established in ancient traditional system of Indian medicines i.e. Ayurveda. 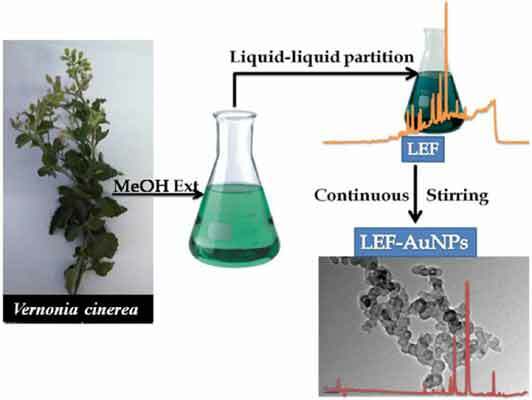 Recently, nanotechnology has drawn the attention of researchers to develeope various size and shape nanoparicles / composite for number of applications.In this article, we report the enrichment of lactone enriched fraction (LEF) by liquid-liquid portioning of Vernonia cinerea metabolic extract and sysnthesis of mediated nano-gold composite (LEF-AuNPs) in single step process. The morphological characteristic based on transmission electron microscope (TEM) image analysis showed that LEF-AuNPs were predominantly nanopolygons and nanobots in shapes ranging from 50-200 nm in size. Abundance of phytochemicals in both LEF and LEF-AuNPs was dissimilar. In LEF, montanol- a diterpenoid, while in LEF-AuNPs, neophytadiene- a phytanes was the major compound. HPLC profile of relatively polar compounds also varied drastically. In-vitro biocompatibility, cytotoxicity [MTT (3-[4,5-dimethylthiazol-2-yl]-2,5 diphenyl tetrazolium bromide) based assay] and storage stabilitiy of LEF-AuNPs were evaluated. The moderate ability of LEF-AuNPs to restrict parasitaemia, extended mean survival time of mice infected with Plasmodium berghei and lack of any evident toxicity provides new opportunities for the safe delivery and applications of such nanocomposites in malaria therapy. Vernonia cinerea, lactone enriched fraction, nano-gold composite, cell-toxicity, biocompatible, antimalarial. Analytical Chemistry Department, CSIR-Central Institute of Medicinal and Aromatic Plants, Lucknow-226015, India.